Title: White Cloud near Bilsington. 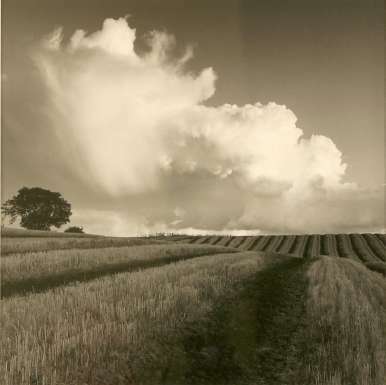 Fay Godwin had no formal training in photography and she initially began by taking portraits and doing PR work. Her love of walking led her to pursue landscape photography and she published her first book The Oldest Road : An Exploration of the Ridgeway with J.R.L. Anderson in 1975, which established her reputation in this area. "Here is not the bucolic Britain of pretty villages and meadows but a wider, more mysterious land - a land of ancient stones and windswept marshes, mountains and menacing cloudscapes." Ian Jeffrey, preface to Land, 1985.